VST baskets are not a new piece of equipment by any means. Since their release around 2-3 years ago, many cafes and home espresso enthusiasts have been sold on the idea of a precision-engineered, optimised filter basket and have switched their standard, machine-included baskets for shiny new VSTs. Using Richard Muhl’s crazy shot brewing device and a Synesso Sabre in our Victorian Training facility, we set about testing just how consistent VST baskets are and found it was easy to obtain consistency and repeatability in our results by exercising due care and employing repeatable practices. To put this in context, we need to define exactly what we are testing. Filter baskets act as the environment where it all takes place to produce the filtered, emulsified, diffused beverage we know as espresso coffee. VST baskets are designed with specificity in mind in terms of how much coffee mass we should be dosing, and have filter holes which are sized and distributed specifically to result in a particular extraction yield range of 18 — 22%, across a range of brew ratios when we adjust our grind particle size to match. This is the amount of coffee we use, expressed as weight. VST baskets are designed to work within a 3 – 4 gram range of dose weights and are manufactured in several sizes. Most filter baskets are purposely or inadvertently designed with this attributed, but VSTs also have filter holes which match the target coffee mass and particle size to deliver specific results. This is the amount of coffee mass that goes into the basket vs. the beverage mass that comes out. For example, a fairly standard espresso shot uses a 1 : 1 ratio. (This is considered to be a ristretto shot by VST standards.) Or you can think of it as 20 grams of coffee mass vs 20 grams of extracted beverage. Different brew ratios will have different levels of concentration or strength. This is the total amount of diffused elements obtained from coffee during extraction. Put simply, it is the maximum amount of a coffee’s mass which is removable. It’s usually around 28%, but we don’t want all of that. Generally with espresso, a reading of the Total Dissolved Solid % (the amount of solids present in our brew) is attained using refractometery. Using the initial dose mass, we can then calculate how much of our coffee’s diffusible content has been removed. Historically, a range of 18 — 22% of the coffee mass has been deemed to be the spot to hit in terms of flavour. The TDS % differs depending on how diluted the espresso is, and directly correlates to concentration or strength. Filter baskets have holes which allow brewed liquid to pass through them. The more total surface area these holes provide as an escape route for water, the faster our flow rate will become. Dose mass, volume, headroom and saturation. 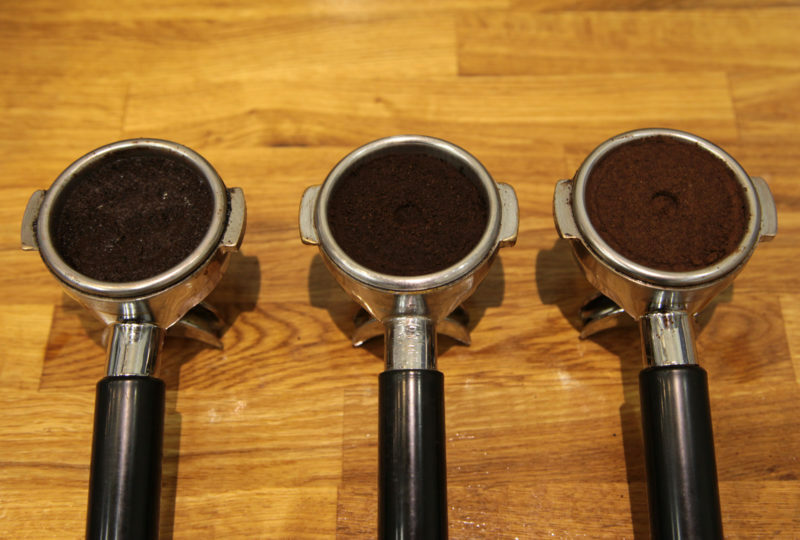 The finer we grind coffee, the more efficiently it will fit together when compressed and the less space it will take up. 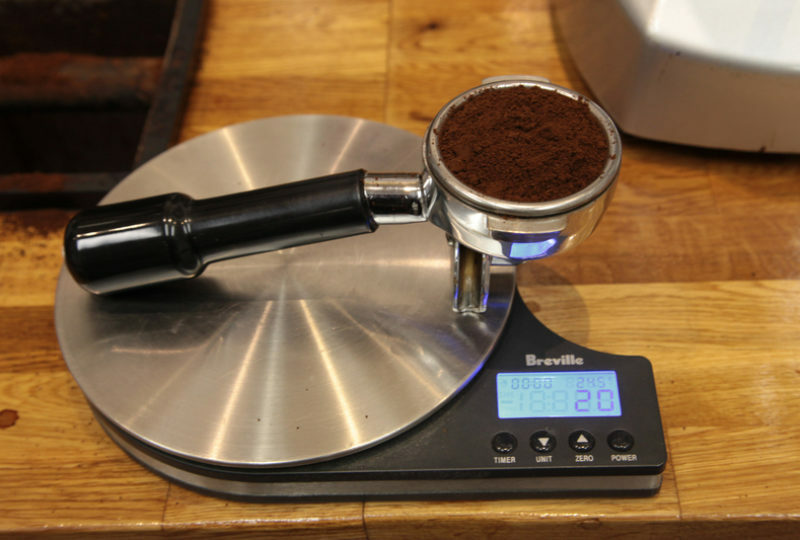 Put another way, if we are measuring and setting the dose by weight, this means that when we adjust our grind finer, the level at which the coffee sits in the basket will drop even though the weight of coffee has not changed. Of course, it works in the opposite way if we are grinding coarser. 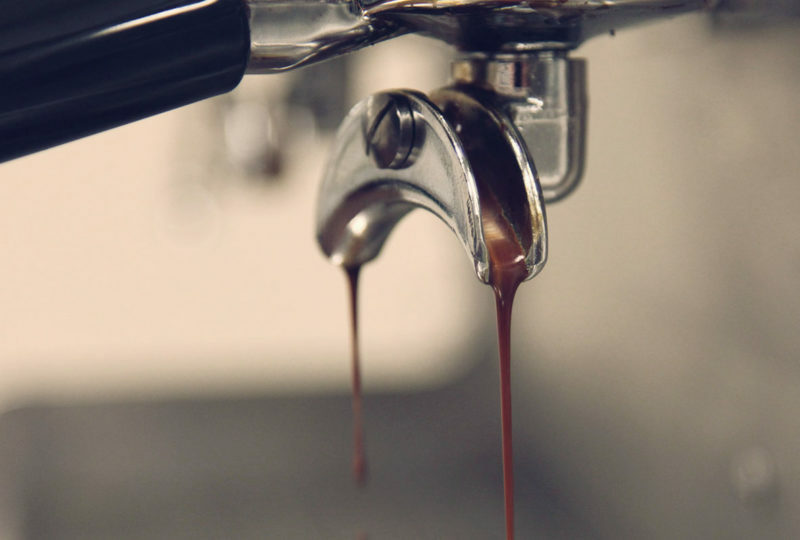 We principally use the size of our grinds to affect the rate at which our espresso flows. However, the same extraction process is also affected by the depth at which coffee sits in a portafilter due to saturation and headroom (see below). Headroom is the space above where the coffee sits level in the basket. Headroom ultimately dictates how much or little space coffee has to expand during the extraction process. Saturation and resistance are other factors which are affected by the dose mass, volume and grind. Within the extraction process, water generally travels around the edges of the basket and eventually makes its way through the centre of the shot as resistance is built up from extraction pressure and the coffee itself. The more depth we create from our dose volume, the more we exaggerate this effect; the less depth we create, the faster this process can occur. If you’ve been following the gist of this article so far, you can probably tell I’m in favour of VST baskets. My only advice would be to experiment when setting them up to get optimal results.